Wherever Jesus went he knew, without a doubt, that the unlimited power of God was working in and through Him. He knew that nothing was impossible or too hard for God. 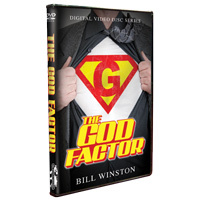 In his new series “The God Factor,” Dr. Bill Winston shares straight from the Word of God how every believer can walk in the same power that Jesus did. How? By understanding the God Factor! There is nothing too hard for God. And now that you are in the Kingdom of God there is nothing too hard for God to resolve, restore, replace or recreate in your life. Let the revelation shared in this series help you to fully manifest the Kingdom in your life as you learn how to exercise the God Factor!